When I was a little girl, Valentine's Day was the highlight of winter for me. Mid-February can be such a cold, gloomy time . . . but right in the midst of the winter gloom comes a holiday dedicated to love. And fun. And candy! I still like to send and give Valentine's cards, but adult-sized Valentine's cards are a lot more expensive than the little greetings exchanged by schoolchildren. I wanted several cards to send to family and friends, but at $1 to $5 each, store-bought cards were out of the question. and in my stationery box I had some blank cards. Hopefully the intended recipients of these cards aren't reading this post; otherwise, their Valentine's cards won't be much of a surprise. There are a couple of our neighbors who weren't around at Christmastime, so I think I'll bake some treats and deliver one of these cards with a plate of goodies. Don't you think that'll be fun? What do you do to celebrate Valentine's Day? What a great idea Richella, I love it. I could do something similar with my Christmas cards too :) I better get busy it takes at least 5 days to mail them to England! Great idea!! I still have a bunch of those Christmas cards left too. Your neighbors will be so pleasantly surprised. Vday is on Monday, which means T will be at work from 9 to 9...which means we won't do anything. What a great idea! 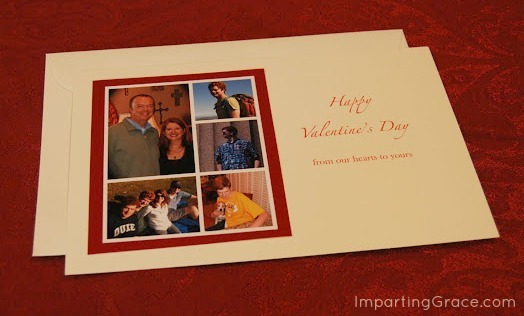 I never think to send cards at Valentine's Day to people other than my immediate family. How thoughtful of you! You are so smart!!!! What a great idea! They turned out beautiful. Your neighbors will LOVE you for sure! Great idea, Richella! Those turned out so cute. I have pics left - This is SUCH a great way to use them, bless somebody and DECLUTTER a bit! What a fantastic idea! Love it!! I always have extra Christmas cards left over with our pictures on them! Thank you so much for sharing your brilliance! Great idea! You are killing two birds with one stone: new cards for V-Day and using up leftover ones. I'm sure that the recipients will love them. We are going to grill steaks for V-Day. I have no desire to fight the crowds to eat dinner out! What a lovely idea...they turned out great, Richella! Everyone will love them! I've thought of making some type of card with leftover Christmas cards because it's such a shame to waste them. I've just never got around to doing anything. Now I know what I'll use those extras for next year ;) That's a GREAT idea for Valentine's Day! I think I just found one area of our lives in which we are different. I do NOT have the crafty gene. I'm pathetic. But I sure do love your ideas! I hope you'll still love me. That's such a smart idea! I have a bunch of Christmas cards left too, but the photo is a little too Christmas-y.